Dorinda is a storm that threatens all of Oz, whose only hope is the Witch of the West, Minerva. Years ago, Minerva sent Dorinda away, hoping that a magical prophecy of Dorinda destroying Oz would never come to fruition. When the girl returns with murder on her mind, Minerva knows she has made a terrible mistake. One by one, Dorinda strips Minerva’s allies of their strength. She turns the King of the Lions into a pusillanimous lion. The emperor of an allied kingdom is now a straw effigy, the woodsman’s body now made of tin. Is the prophecy doomed to pass after all? Will the wizard of Oz aid Minerva or Dorinda? 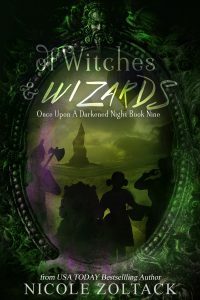 Of Witches and Wizards also includes the short stories The Cost of War and The Cost of Peace.